Agile Transformation: My book is finished! Comments Off on Agile Transformation: My book is finished! Interested in the content? Download a FREE preview copy here! If you want to buy the book, click below on the book cover. My book about Transforming to The Agile Way of Working is finished. 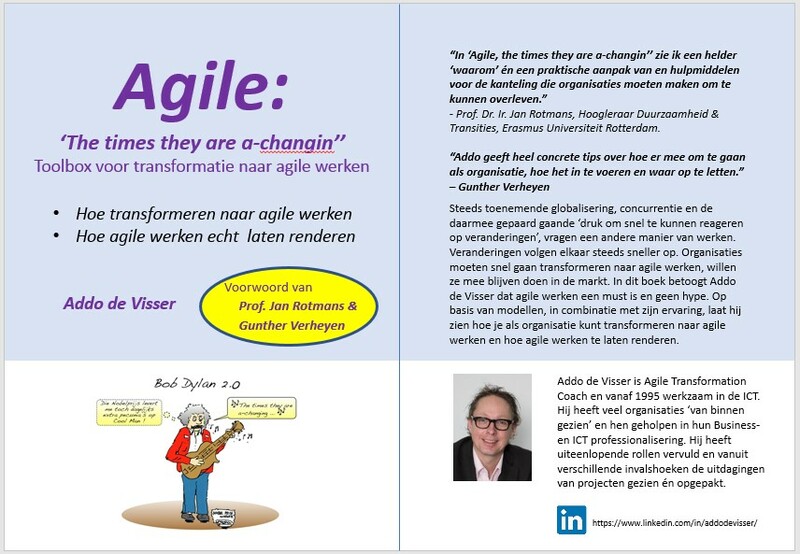 Title: ‘Agile – The Times they are a-changin”. In my book I will reference a lot of useful models. You can use these in your day-to-day work when you are involved in an agile transformation. Or want to start one! I’m thankful that so many colleagues have helped my with reviews. And I’m honoured that Prof. Jan Rotmans and Gunther Verheyen have written a preface. Both are frontrunners in my opinion in the field of Transition and Agile. The first edition will be in Dutch. Interested in the English version? Or do did you do an ‘inspect’ on the book and would like to suggest an ‘adapt’? Drop me an email! (only in Dutch) Jan van Setten – Hoe krijg ik ze zo ver?